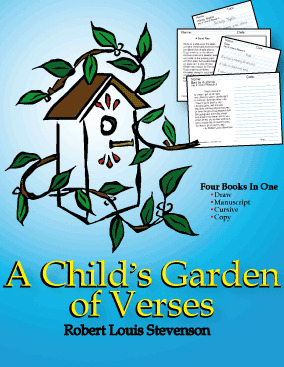 A Child's Garden Of Verses written by Robert Louis Stevenson is a beautiful collection of children's poems! This download is a wonderful way to give your student beautiful handwriting practice while learning beautiful poems! A Child's Garden Of Verses written by Robert Louis Stevenson is a beautiful collection of children's poems, the ones we all enjoyed as children. This download is a wonderful way to give your student beautiful handwriting practice while learning beautiful poems! Mr. Stevenson wrote many of these when he was still just a boy! Level One has the poem written with a place for the student to draw a picture. Level Two has the poem written on lined paper in manuscript with a blank line for the child to copy. Level Three is similar to Level Two but in beautiful cursive writing. Level Four has the poem written on one side and plain lines to copy the poem on the other side.